These meatballs are always a crowd pleaser. 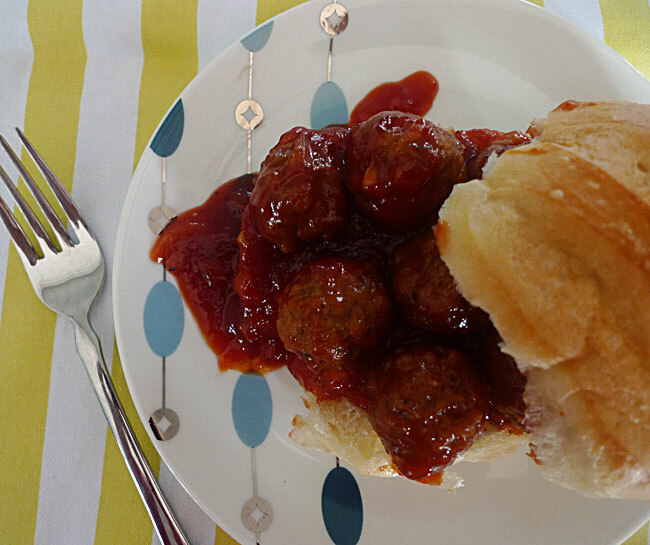 I love to serve the meatballs alone for a hearty appetizer, or on hoagie rolls for a meal. If I'm in a hurry, I'll use pre-cooked frozen meatballs instead of making them from scratch, though if you have the time, definitely make them from scratch, they're way better. I also love to serve the sauce over meatloaf. In a bowl, combine all meatball ingredients, mix well. Roll into 1 inch balls. Place meatballs in an ungreased 1 quart baking dish. In a separate bowl, combine all sauce ingredients, mix well. Pour sauce over meatballs. Cover and bake for 1 hour at 350 degrees. Serve on sandwich rolls, if desired. You can substitute 1 lb. of pre-cooked frozen meatballs. Combine the frozen meatballs and sauce. Either heat through in a large saucepan, bake at 350 for 20 minutes, or in a crockpot on high for 2 hours. It's important that the sauce be heated along with the meatballs, so that the meatballs stay moist and the sugar in the sauce can dissolve. The sauce freezes great, I often make up large batches and freeze it in quart bags. Recipe saved. I will try this out soon!! You will love it. Cory started drooling the second he saw me writing this post. Oh, my word. This is your mother's recipe, and I just made them for tonight's supper. Our great minds must think alike. :-) I've been thinking of calling you...Martha and I were laughing over a couple Bastine girl stories yesterday. Those were great times for sure! Talk to you later! Oh wow, too funny! Absolutely, we need to catch up. I miss you girls. Blend the right sauce to make the meatball tastier.